Congratulate the new graduate with a homemade gift, card or party decoration from this FREE eBook! 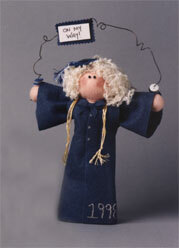 You can create this personalized graduation gift by dressing the graduate doll in school colors for that big day. Use as a special graduation gift or display as a centerpiece or keepsake at graduation parties. This makes a great easy handmade graduation gift. Find this craft and 17 others in our FREE Graduation Craft eBook. Insert a 4" length of 18-gauge wire halfway into the ball (head) and the top of cone (body); glue in place. Head: Center 9" square of apricot felt over head; pull felt tightly around ball to the neck and secure with 26-gauge wire. Glue excess felt to cone. Arms: Glue and insert 1" balls on either end of 9" length of 18-gauge wire. Gather a 5" square of apricot felt around each "hand". Secure around the wrists with 26-gauge wire; twist wire around the arm wire to hold in place. Glue together long edges of 7" x 18" piece blue felt, forming 18" long tube. Insert arms into tube and wire arms in place behind neck. Gown: Fold in half a 7" x 18" piece of blue felt; the folded piece should measure 7" x 9". Following Diagram 1, cut a notch in the fold as shown; this will be the neck opening. Measure in 2" from each shoulder and draw a line from these points to the bottom corners (see Diagram 2); cut along these lines. Glue side seams together; cut open the front of gown, from neck to hem line. Dress doll in gown, with opening in front; glue opening shut. Cut out bow using Pattern A. Cut a 1/4" x 1" piece of felt and glue around center of bow. Glue bow to neck. Blush cheeks; glue on eyes. Glue hair to head. Paint wood pieces blue; let dry. Stack and glue together 1" circles; glue square on top of 1" circles. Make a tiny tassel: Wrap both colors of rayon thread four times around two fingers; wrap a 6" thread several times around one end, 1/4" from end (see Diagram 2). Knot thread and cut off excess; cut thread loops and fluff. Glue to center of wood square, and glue hat to doll's head. Cut a small sign out of white paper and write "On My Way" (see Diagram 3). Cut a piece of blue felt 1/4" larger than sign; glue to back of sign. Glue sign to an 18" length of 18-gauge wire, 8" from one end. Twist wire and wrap around a pencil to shape. Slip three buttons on left side of wire and four buttons on the right side. Insert ends of wire into hands; glue securely. Cut four, 10" lengths of rayon thread; tie together 1" from each end. Glue to back of doll's neck and let hang down the front. Using silver paint, make "buttons" down the front of the dress. Write the year on the bottom front of gown. ®™ Trademark of The Dow Chemical Company ("Dow") or an affiliated company of Dow. For more project ideas, please see styrofoamstyle.com.